When testing a captive portal with a virtual station on a LANforge machine, you are faced with a problem of multiple gateways. When the station associates, it gains a DHCP address with a new gateway and DNS server. Your LANforge machine will already have a default gateway and DNS server assigned to it throught the management interface it has on boot. You need to use both. On top of that, you are connected via screen-sharing to a laptop and not to the LANforge machine directly. If you’re lucky, you have a working serial console connection between the screen-share laptop and the LANforge system. I mention working because sometimes the quality of USB serial adapters is spotty. When it works, you have a way to set new values into /etc/resolv.conf and a default gateway. And that should restore your management connection to what you had during boot up. The problem is, everything your browser will want to do will use your default gateway, not the virtual stations. Changing the default gateway will drop your connection to the LANforge machine and you will be lost from it. When you are developing remotely, you can waste days waiting for your remote counterpart doing hands-on to reboot the LANforge when you lose the network settings. Luckily, LANforge boxes come with squid and dnsmasq installed. We can start by setting up dnsmasq, so that we can direct DNS requests through the stations DNS setting. www.cnn.com is an alias for turner-tls.map.fastly.net. Do not enable dnsmasq using $ sudo systemctl enable dnsmasq; sudo systemctl daemon-reload. That will take effect after a reboot and you might not remember doing it. Please remember to comment out 127.0.0.1 in /etc/resolv.conf. We want to set the tcp_outgoing_address setting in our /etc/squid/squid.conf file. The Network settings in FireFox are under Edit→Preferences and Advanced→Network. Edit the HTTP proxy to be 127.0.0.1 and port 3128. Erase the values for No Proxy for because having 127.0.0.1 and localhost in there will force FireFox to make no connections whatsoever. Capturing a captive portal redirect is usually a matter of sending any HTTP request over the station and the response will be a 302 (or 307) redirect. In the /home/lanforge/scripts directory, you might have a portal-check.pl script. This script performs most of the outlines steps discussed so far. It is useful for helping validate the environment and gathering data to use with portal-bot.bash. When diagnosing behavior of captive portals, often they are constructed to redirect to arbitrary high-level ports. Feel free to add more ports to your tcpdump filter. But at this point, curl is probably going to be your best friend. The LANforge Port Bringup plugin produces a highly detailed and verbose report including all the wifi events from the stations involved. 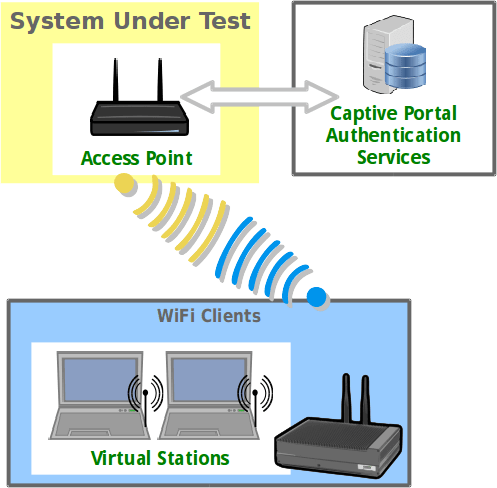 This plugin can be used to record performance of station association and captive portal logins. When you save the Graphical Report screen, it saves an HTML document with pictures to a directory on your machine. I have example update_report.sh and report.js examples posted for you to download and use. 1499751346.697  # Bringing all selected ports down. Bar charts are created with the create_bar() function.